Existing climate change governance regimes in the US and the EU contain complex mixtures of regulatory, market, voluntary, and research-based strategies. The EU has adopted an approach to climate change that is based on mandatory greenhouse gas emission reductions; it is grounded in 'hard' law measures and accompanied by 'soft' law measures at the regional and Member State level. In contrast, until recently, the US federal government has carefully avoided mandatory emission reduction obligations and focused instead on employing a variety of 'soft' measures to encourage - rather than mandate - greenhouse gas emission reductions in an economically sound, market-driven manner. These macro level differences are critical yet they mask equally important transatlantic policy convergences. The US and the EU are pivotal players in the development of the international climate change regime. How these two entities structure climate change laws and policies profoundly influences the shape and success of climate change laws and policies at multiple levels of governance. 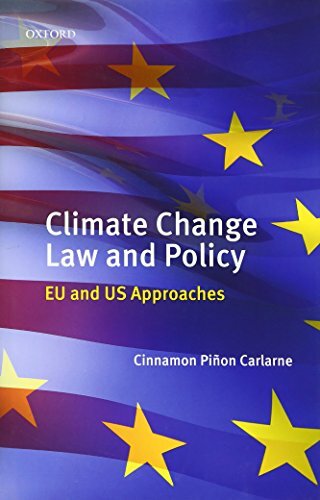 This book suggests that the overall structures and processes of climate change law and policy-making in the US and the EU are intricately linked to international policy-making and, thus, the long-term success of global efforts to address climate change. Accordingly, the book analyses the content and process of climate change law and policy-making in the US and the EU to reveal policy convergences and divergences, and to examine how these convergences and divergences impact the ability of the global community to structure a sustainable, effective and equitable long-term climate strategy.